Our society is suffering a sickness—moral decay! In an age of personal freedoms, where an individual’s ‘right’ to do what is right in their own eyes is also seen as politically correct, most people—including some Christians—feel powerless to do anything about society’s ills. When a sickness reaches epidemic proportions, there is a frantic search for a cure. Consequently, polio and smallpox have been virtually eradicated due to vaccines. If doctors were on the verge of finding a cure for cancer or arthritis, and they asked people to donate and help their search for such a cure, most people would be happy to oblige. So what is the answer for a sick society? My mind goes back to the early days. 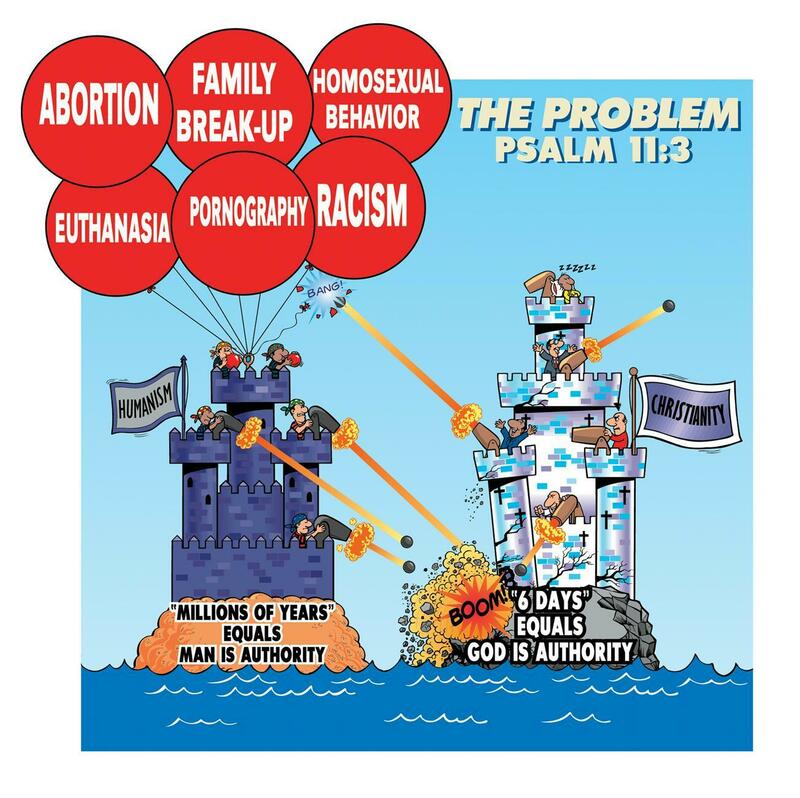 I can remember Carl Wieland explaining that the ills in our society, such as increasing lawlessness, abortion, homosexual behaviour, etc., were just symptoms of the real problem. I’m sure that many of you are now familiar with our ‘famous’ castle diagram (shown left). It aptly demonstrates that most Christians are addressing the symptoms only, and are not also dealing with the foundational problem of secular humanism, where man decides ‘truth.’ The justification for humanistic beliefs is evolution/long ages, because these undermine the authority of God’s Word, and remove God from His rightful position as Creator (and thus the One who sets the rules). Doesn’t this demonstrate that people are really looking for answers, and, most of all in this ‘confused’ world—the truth?! Jesus reminds us in Mark 2:17, ‘… It is not the healthy who need a doctor, but the sick. 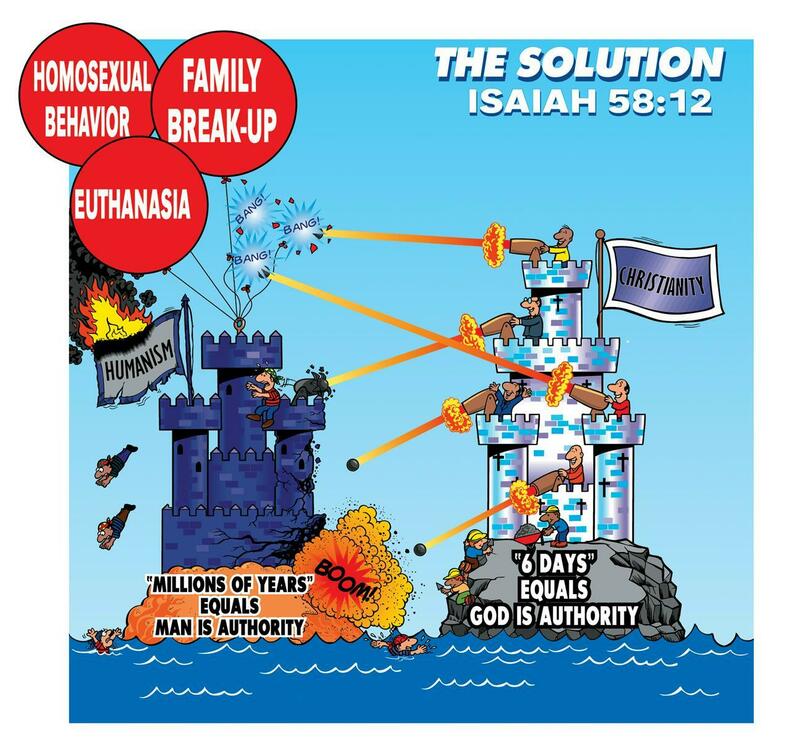 I have not come to call the righteous, but sinners.’ The problem though, is that our evolutionized humanistic society disregards its medicine, the authority of the Bible which leads them to the cure—Jesus—the Saviour of this fallen world. Thank you to Dustin, and all of you for partnering with us in our efforts to impact this world for Christ.